The solution came via an overheard conversation at breakfast. A French lady, sitting at the next table, was asking the staff about options of going around the island by boat. I quickly added that we’re interested in that as well and a couple from South Germany, sitting a table further, did the same. In a matter of ten minutes we had a group of six and a booked half-day boat trip of seeing waterfalls and snorkelling. The next morning at 10am it was time to set off. The boat was small and fast, and the views of the island beautiful. I just had to remember to hold to my hat, wouldn’t want to lose it in the clear waters! Unfortunately the Southern mountain peaks had decided to hide in the clouds so we didn’t get a clear view of the two ‘horns’ of Tioman. First stop of the day was the waterfall. To get there, we had to take a walk through the jungle. After a brisk uphill trek (after all, we had had our practice! ), we arrived at our goal. Meanwhile Daniel was being his usual gallant self. We took our shoes off and went to test the wonderfully cool and refreshing water. For Daniel, however, just dipping the toes was not enough! The little daughter of our boat driver soon followed. Next we went out in the sea for some snorkeling. It was so much fun that we never stopped to take pictures of how silly we looked in the snorkeling masks. And soon it was time for lunch in a beautiful little place, tucked between a river-bend and the sea. After a lunch and a chat with our fellow travelers the boat was waiting and it was time to set out again. 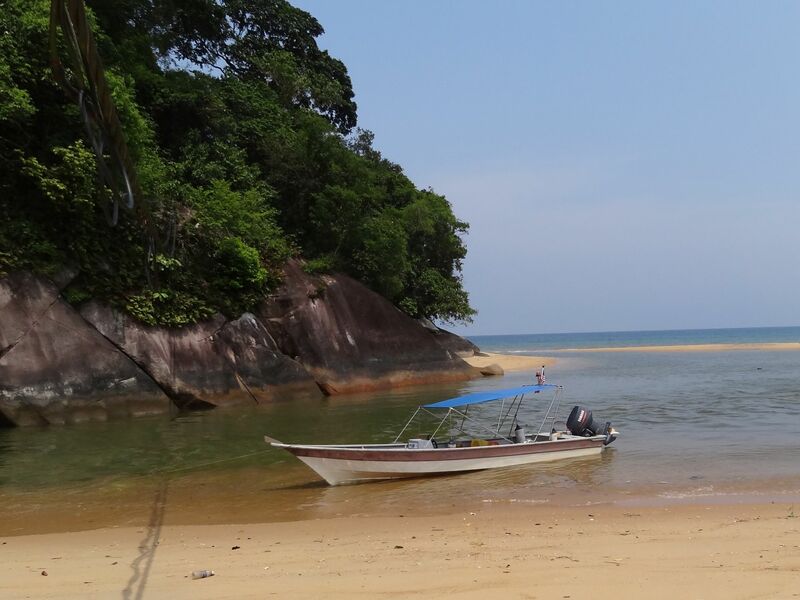 This time we went to, from the looks of it, the most popular snorkeling place of Tioman. It was crowded with other boats and snorkelers and soon we understood why: the corals were wonderful and it was teeming with colorful tropical fish and other underwater life. To quote our boat driver: if you’re lucky you may even see a shark! Luckily we didn’t get ‘lucky’. We couldn’t make photos underwater so, to give you an idea of what hides beneath the surface, here’s a photo from the Singapore aquarium. Imagine a little less fish and a little more corals and you’ll have a pretty good impression of what we saw! In the evening we treated ourselves to some after-dinner beer and satay. Sitting on our terrace and enjoying our final evening on the island, we didn’t realise that this day is our one month wedding anniversary. Although we didn’t toast for it, I’d say it was a day well-spent. That’s all about our adventures in Tioman! We hope to return some day in the not-too-distant future.